The Pipestoppers division of British company Huntingdon Fusion Techniques has launched its new Accu-Freeze System, which will allow pipe repairs to be performed without having to shut down and drain the entire system. According to HFT, Accu-Freeze will work on both metal and plastic pipes of diameter up to 12” (305mm). The system creates ice plugs on either side of the repair site without draining the whole system. HFT have already carried out a successful installation of Accu-Freeze, for a client contracted to carry out repair work in a large block of apartments. “Working in the plant room, access was pretty tight as the pipes were only 6 – 8” (152mm – 203mm) from the ground. At one end of the pipe there was a pressure gauge and at the other, a 1,000 litre hot water cylinder. Ambient temperature in the pipe was approximately 38ºC”, says a statement from HFT. 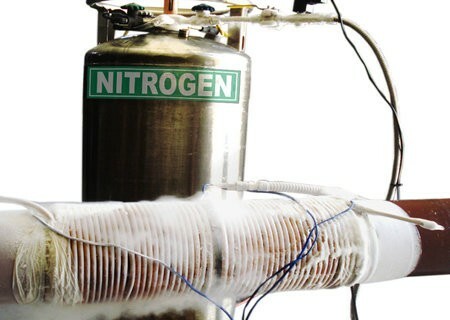 Accu-Freeze uses LN2 in a controlled way to freeze stationary liquids in a selected section of pipe or tube. By controlling the temperature, Accu-Freeze forms an in-line ice plug capable of withstanding 138 bar in diameters up to 12” (300 mm).